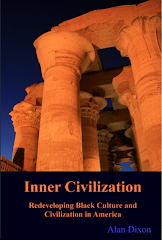 Inner Civilization: Who Burns Books? 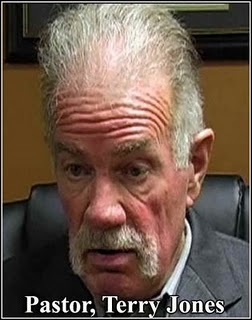 Pastor Terry Jones and The Dove World Outreach Center in Gainesville, Florida, are planning to burn several copies of the Quran on the 9th anniversary of the September 11th Attacks. We have to wonder where did this book burning practice come from? 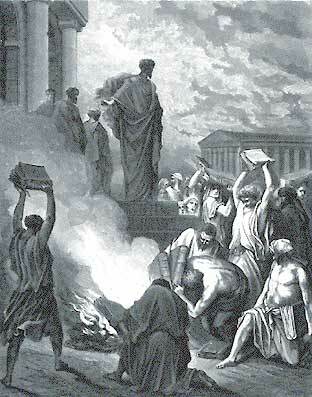 Who would try to burn books? What kind of company would the Dove World Church be joining? If ultimate truth is seen as a concept that would include and explain everything, what’s left to burn? The Royal Library of Alexandria, or Ancient Library of Alexandria, in Alexandria, Egypt, was the largest and most significant great library of the ancient world. The first know n library of its kind to gather a serious collection of books from beyond its country's borders, the Library at Alexandria was charged with collecting all the world's knowledge. The library of the Serapeum in Alexandria was trashed, burned and looted, 392, at the decree of Theophilus of Alexandria, who was ordered so by Theodosius I. It was here where Theodosius proudly proclaimed that all of the world’s ancient knowledge has been destroyed. Arius taught that Jesus Christ was divine and was sent to earth for the salvation of mankind but that Jesus Christ was not equal to the Father (infinite, primordial origin) and to the Holy Spirit (giver of life). In 321, Arius was denounced by a council at Alexandria for teaching a different view of the relationship of Jesus to God the Father. Because Arius and his followers had great influence in the schools of Alexandria—counterparts to modern universities or seminaries—their theological views spread, especially in the eastern Mediterranean. By 325, the controversy had become significant enough that the Emperor Constantine called an assembly of bishops, the First Council of Nicaea, which condemned Arius' doctrine and formulated the original Nicene Creed of 325. 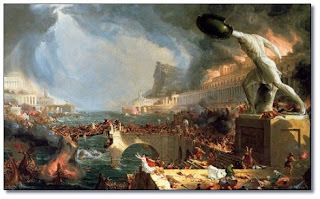 Constantine is believed to have exiled those who refused to accept the Nicean creed. The Emperor also ordered all copies of the Thalia, the book in which Arius had expressed his teachings, to be burned. The House of Wisdom was a library and translation institute in Baghdad, Iraq. It was a key institution in the Translation Movement and considered to have been a major intellectual center of the Islamic Golden Age. The House of Wisdom acted as a society founded by Abbasid caliphs Harun al-Rashid and culminating with his son al-Ma'mun, who reigned from 813–833 CE . Mamun is credited with bringing most of the well known scholars from around the globe to share information ideas and culture in the House of Wisdom. Based in Baghdad from the 9th to 13th centuries, many of the most learned Muslim scholars were part of this excellent research and educational institute. As time passed The House of Wisdom took on new functions related to mathematics and astrology, advancing those fields far beyond their former state. The House of Wisdom was destroyed during the Mongol invasion of Baghdad in 1258, along with all other libraries in Baghdad. It was said that the waters of the Tigris ran black for six months with ink from the enormous quantities of books flung into the river. 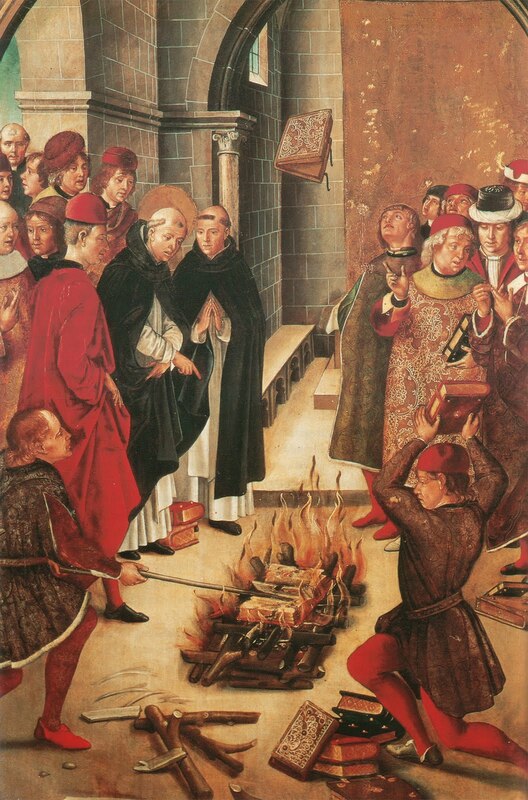 In 1242, The French crown burned all Talmud copies in Paris, about 12,000, after the book was "charged" and "found guilty" in the Paris trial sometimes called "the Paris debate". Since the Church and Christian states viewed the Talmud as a book hateful and insulting toward Christ and gentiles, subsequent popes were also known to organize public burnings of Jewish books. The most well known of them were Innocent IV (1243–1254), Clement IV (1256–1268), John XXII (1316–1334), Paul IV (1555–1559), Pius V(1566–1572) and Clement VIII (1592–1605). Once the printing press was invented, the Church found it impossible to destroy entire printed editions of the Talmud and other sacred books. Johann Gutenberg, the German who invented the printing press around 1450, certainly helped stamp out the effectiveness of further book burnings. Andalusia served as the catalyst to the revival of Europe. Over decades thousands of Arabic manuscripts were translated into Latin. Yet under the influence of the Church a steady campaign to take Spain away from Islamic influence persisted. To exert social and religious control, in 1480, Isabella and Ferdinand agreed to allow the Inquisition in Spain. On January 2, 1492, the leader of the last Muslim stronghold in Granada surrendered to armies of a recently united Christian Spain. They forced the remaining Muslims and Jews to leave Spain, convert to Roman Catholic Christianity or be killed for not doing so. 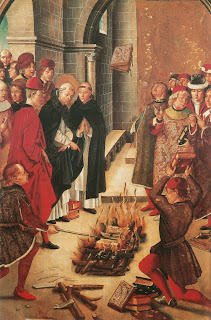 In 1499 about 5000 Arabic manuscripts were consumed by flames in the public square at Granada on the orders of Ximénez de Cisneros, Archbishop of Toledo. The German poet Heinrich Heine wrote about this, stating "Dort, wo man Bücher verbrennt, verbrennt man am Ende auch Menschen" (Where they burn books, they will also, in the end, burn humans), a quote written on the monument for the Nazi Book Burnings today. 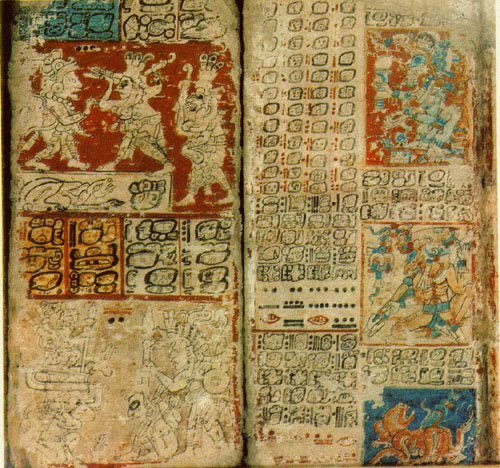 The Spaniards struck again in the Americas in 1652.
ordered the burning of some reported 27 hieroglyphic scrolls, (Maya codices) stating that they contained the work of the devil and prevented them from learning/accepting Christianity. As narrated by de Landa himself, he had gained access to the sacred books, transcribed on deerskin, by previously gaining the natives' trust and showing a considerable interest in their culture and language). 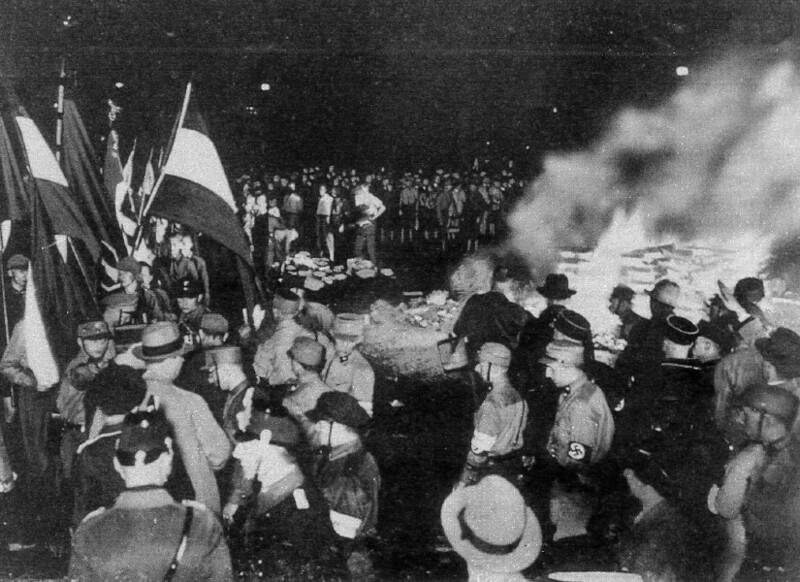 Nazis burned works of Jewish authors, and other works considered "un-German", at the library of the Institut für Sexualwissenschaft in Berlin. The works of some Jewish authors and other so-called "degenerate" books were burnt by the Nazis throuhgout the 1930s and 1940s. Richard Euringer, director of the libraries in Essen, identified 18,000 works deemed not to correspond with Nazi ideology, which were publicly burned. FB Equipment is one the yolasite.com most effective car liker and also Here follower app which aids you to boost FB Liker for your Android Smartphone & Computer your Facebook likes on the go. The FB FB Liker Tools app has an easy as well as easy interface FB Liker App which enable you to get limitless Facebook likes. while we did the stove-top food preparation splashthat.com/ yet that they likewise functioned properly as cooking Page area devices. Built from durable, food-safe silicone, The Ultimate High Chair Shopping Guide As well as Reviews each vivid piece.